Ultra-High Pressure Water Jetting is steadily gaining use for many applications such as hydrodemolition, hydroblasting, and surface preparation. The use of this effective tool offers many advantages, but it also comes with some significant safety issues. Patented TurtleSkin WaterArmor is designed with the toughness to reduce some of the operator hazards with ultra high pressure water jetting and the flexibility that allows operators to move around easily to perform their work. Water jetting creates wet, slippery conditions where operators must maintain control of equipment that can use up to 80 pounds of thrust. In this environment, an accident may occur from something as simple as slippage or loss of balance. Even a momentary swipe of a UHP water jet stream across any part of an operator's body can cause serious injury. TurtleSkin WaterArmor's patented material help protect operators from life-threatening injuries that can result from an accidental swipe. Water jet operators often have to work in tanks, trenches, or other confined spaces where their mobility is severely limited. These confined environments can make it necessary for operators to lie on their sides or backs or to blast over their heads in order to get the job done. TurtleSkin WaterArmor's hinged panel design provides the operator with enough flexibility to move around in tight spaces. While there is no absolute quantifiable data on UHP water blasting accidents, the accidental injuries suffered by water jet operators are a clear indication that protective equipment is always necessary. Water jet operators must evaluate each individual water jetting event to determine the appropriate level of protection that they will require. What are the hazards you'll be exposed to? What is the water pressure? At what distance is standoff at the nozzle? What is the velocity? What is the flow rate? These are just some of the variables to consider. For any job that involves UHP water jetting, TurtleSkin WaterArmor can provide protection to keep operators safe from severe injuries. 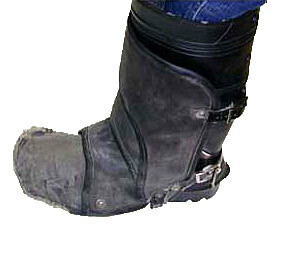 Waterjet operator working inside a tank at a California work site accidentally swiped edge of gaiter. Using a straight lance with pressure at 20,000 psi. "I was unaware of the hit, until end of day inspection of the equipment." 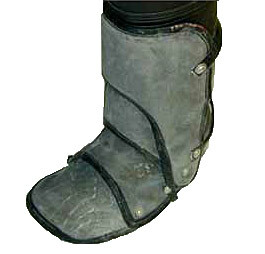 TurtleSkin WaterArmor toe component saved the waterjet operator from severe injury. Waterjet lance trigger malfunctioned at a pressure of 36,000 psi. 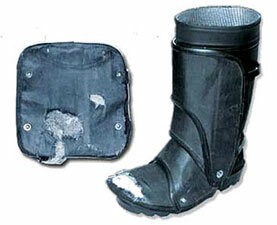 • 800 Gaiter working hours. "The swiftness and efficiency in the way that you (Warwick) responded to my company's need is both refreshing and greatly appreciated." 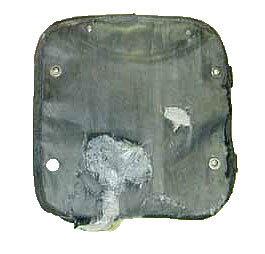 TurtleSkin WaterArmor shin component from chaps which saved the waterjet operator from severe injury. Accidentally swiped at a pressure of 36,000 psi. "We have been using PPE for our waterblast personnel since July of 2000. I was unaware of the fact that this equipment could be purchased in specific pieces. Now I will be able to order parts and not have to incur the extra costs of equipment that I do not need." 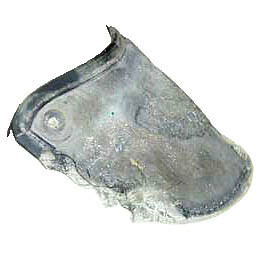 Toe component of TurtleSkin WaterArmor gaiter swiped by a waterjet. Accidentally swiped during surface preparation of aluminum structure. Using a rotating waterjet lance with pressure at 36,000 psi. • 200 Gaiter working hours. "I always wear my personal safety equipment."